Roald Dahl’s James and the Giant Peach has all the hallmarks of a classic children’s fantasy: a young boy embarking on a great adventure, overcoming evil forces, and enlisting the help of talking creatures. But the beloved novel also breaks from tradition in others ways, from its wild plot turns to its sometimes-violent imagery (R.I.P., Aunts Sponge and Spiker). All of those factors come together in a tale that Dahl struggled to get both written and published, as he overcame his own doubts and stuffy British publishers, among other obstacles. Here are a few other things you might not know about James and the Giant Peach. 1. DAHL’S OWN ORCHARD INSPIRED HIM. Dahl’s house in the English countryside had an apple orchard, where he would often go for strolls. One day, he wondered what it was that made apples grow only so big. “What would happen if it didn’t stop growing?" the author said in a 1988 interview. "Why should it stop growing at a certain size?” Writing about a giant apple didn’t seem quite right, and neither did a giant cherry or a giant pear. Eventually, Dahl settled on a giant peach. “He thought its flesh and flavors were more exciting and more sensual,” Donald Sturrock wrote in Storyteller: The Authorized Biography of Roald Dahl. 2. HE REALLY WANTED TO WRITE ABOUT INSECTS. After deciding to write a children’s novel, Dahl pondered the sorts of creatures that should live in his story. His children loved animals, but he felt Beatrix Potter, A.A. Milne, and so many others had already covered all the interesting non-human characters. So he set his sights on insects. “There seemed to be jolly little that had not been written about, except maybe little things like earthworms and centipedes and spiders,” Dahl reportedly told his daughter Ophelia. It was those very creatures he would incorporate into James and the Giant Peach, in the forms of Earthworm, Centipede, and Miss Spider. 3. HE STOPPED WRITING AFTER A FIGHT WITH HIS PUBLISHER. While writing the book, Dahl learned that his American publisher, Alfred Knopf, had quietly axed publication of his earlier collection of stories, Kiss Kiss. So he stopped working on James and the Giant Peach, which Knopf had expressed enthusiasm for. Instead, he turned his attention to a screenwriting project. “As far as getting a children’s book out of me now, he can stuff that one up his arse,” the often contentious Dahl wrote in a letter to his New York agent, Sheila St. Lawrence. 4. THE CATHOLIC CHURCH PLAYED AN UNEXPECTED ROLE IN ONE OF HIS OTHER WORKS—AND HELPED HIM FOCUS ON THE NOVEL. That screenwriting project involved adapting two dozen classic horror tales, selected by him, for television. The author wrote the screenplay for the first selection, a story called “The Hanging of Arthur Wadham.” It was shot and edited, and seemed on its way to a full release. But then, according to Sturrock, the studio suddenly grew nervous. One of the script's key plot points involved a priest deliberating over whether or not to reveal something said during confessional, and break his sacred vows. Fearing they might offend the Catholic Church and religious viewers, the studio nixed the episode and eventually canceled the series. Frustrated, Dahl returned to writing James and the Giant Peach. 5. WHILE CRAFTING THE STORY, DAHL ALIENATED HIS TRUSTED AGENT AND FRIEND. For more than a decade, Dahl relied on the support and guidance of New York-based agent Sheila St. Lawrence. She encouraged him to write James and The Giant Peach and even contributed ideas that made it into the book, like the scene where cloud men pelt the flying peach with hailstones. After Dahl signed a new agent to represent him in England, Laurence Pollinger, things turned sour with St. Lawrence. Pollinger convinced Dahl to let him handle the translation rights for Kiss Kiss (which Penguin had agreed to publish) and James and the Giant Peach, a job St. Lawrence had overseen up to that point. Dahl broke the news to St. Lawrence, who fired back that he should stay out of it and let her hash out the matter with Pollinger. After arguing with Dahl and with Pollinger, St. Lawrence eventually gave up the fight. She and Dahl made up, but she was clearly wounded by what she saw as Dahl’s shifting allegiance. Less than a year later, she left her job and moved to Ireland. 6. HE WORKED THROUGH TRAGEDY. On December 5, 1960, Dahl’s infant son, Theo, was badly injured after a New York taxi collided with his stroller. To control the buildup of fluid in Theo’s head, which took the brunt of the impact, doctors installed a shunt. The tube frequently became blocked, requiring one desperate visit to the emergency room after another for Dahl and his wife, the actress Patricia Neal. Rather than retiring in grief, Dahl became something of a medical expert and, with the help of doctors and a toymaker, developed an improved shunt called the Dahl-Wade-Till valve. The device went on to be installed in more than 3000 children—but Theo wasn't one of them. By that point, Dahl's son had recovered sufficiently. Dahl also found time to work on James, finishing the book in early 1961. 7. HE SELECTED AN UNKNOWN ARTIST TO ILLUSTRATE THE BOOK. 8. U.S. SALES FOR JAMES AND THE GIANT PEACH WERE REALLY SLOW AT FIRST. 9. IT TOOK SEVEN YEARS TO FIND A BRITISH PUBLISHER. Hard to believe now, but Dahl had a very difficult time finding a publisher for James and the Giant Peach in his native United Kingdom. Longstanding houses sniffed at what they saw as a weird, grotesque fantasy, and some would even claim they took pride in rejecting it. It took a stroke of good fortune for a deal to finally be made. Dahl’s daughter Tessa gave the book to her friend Camilla Unwin, daughter of UK publisher Rayner Unwin (Tolkien fans might recognize the name: It was Rayner who, decades earlier, had recommended publication of The Hobbit to his father, the publisher Sir Stanley Unwin). Unwin saw how absorbed his daughter was with Dahl’s book and looked into its publication status. Despite being mainly a textbook publisher, Unwin decided to snap up James and the Giant Peach as well as Dahl’s latest at the time, Charlie and the Chocolate Factory. 10. DAHL TOOK A BIG GAMBLE ON THE PUBLISHING DEAL. Dahl was so eager to be published and taken seriously in England that he signed a risky deal that would pay him 50 percent of sales receipts—but only after Unwin had recouped production costs. Both books needed to be hits for him to see a payday—and they were. The first printing run completely sold out, and so did the next one, and the one after that. By the early ‘70s, Roald Dahl was a household name in England, and rich to boot. 11. HE DIDN’T WANT IT MADE INTO A MOVIE. 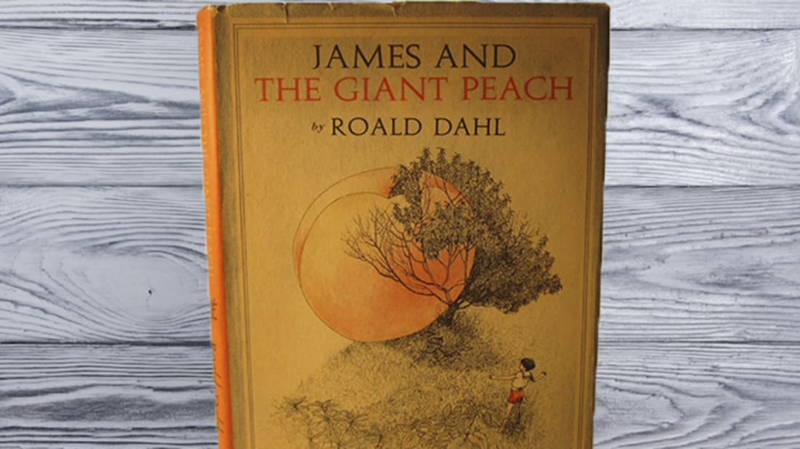 During his lifetime, Dahl turned down numerous movie offers for James and the Giant Peach, reasoning that the story was too difficult to translate to the screen. After his death in 1990, his second wife Felicity (or Liccy as he called her) decided to put the film on market, with the express hope that Henry Selick would take charge. (Selick had directed The Nightmare Before Christmas (1993) and Dahl’s daughter Lucy was impressed by his visual style.) She agreed to Selick’s stop-motion treatment, and the resulting 1996 film got mostly positive reviews. 12. THE BOOK GETS CHALLENGED A LOT. . .
Dahl’s story doesn’t shy away from mature themes like death and child abuse, making it a target for book banners across the country. According to the American Library Association, it was #50 on the list of “Most Challenged Books 1990-1999.” People have also taken offense to the book’s surreal elements and supposed sexual suggestiveness. In 1986, a Wisconsin town banned the book over a scene in which Mrs. Spider licked her lips. 13 . . . BUT DAHL DIDN’T THINK MUCH OF CRITICS. 14. THERE’S A MUSICAL BASED ON THE BOOK. Songwriting duo Benj Pasek and Justin Paul developed a stage adaptation of Dahl’s book, which debuted in 2010 and had extended runs in Seattle and Atlanta. It’s been licensed for school and community productions, meaning you can currently only see it at a nearby high school or local playhouse. You’ll probably get more enjoyment out of the 20-track studio album, which features 2012 film Pitch Perfect’s Skylar Astin, and Broadway stars Brian d’Arcy James and Megan Hilty.